UPDATE (9:40pm) - CEB workers have decided to stage an immidiate island-wide strike in protest over the police assault on them this evening. 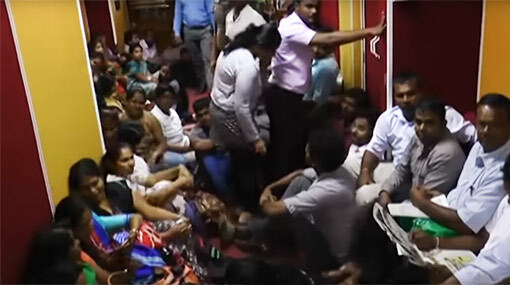 A tense situation has been reported at the Headquarters of the Ceylon Electricity Board (CEB) in Colombo Fort as riot police and special task force (STF) personnel intervened to rescue the CEB Chairman who was being held hostage by protesting employees. A group of employees of the CEB engaged in a protest from morning today in front of the head office against the Chairman accusing him of corruption and also demanding an end to the alleged suppressing of trade union leaders. Protesting employees had then proceeded to block the office of the Chairman forcibly detaining him and preventing him from leaving. The riot police and the STF were later called in to placate the situation, however a tense situation ensued as they attempted to rescue the CEB Chairman who was trapped inside his own office. Meanwhile several CEB employees claim that they were assaulted by police during the incident. CEB trade unions say that employees will launch an indefinite island-wide strike from 9.00am tomorrow (18), claiming that police assaulted them during the protest at the head office.